Sanshoku (meaning three colours) is a common theme in Japanese cuisine where three different flavours are served together to complement the great colours. These delicious mochi are a great snack to enjoy for the New Year celebration, but can also be enjoyed all year round. 1. Prepare 6 mochi pieces by heating the mochi on a griddle or non-stick pan over a low flame without oil for a few minutes on both sides, until the outside turns crunchy and the inside soft. 2. Mix 3 tablespoons of kinako with 3 tablespoons of sugar and sprinkle on to 2 of the grilled mochi. 3. 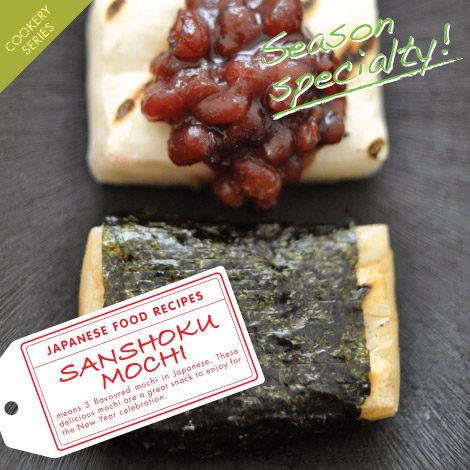 Open the azuki and place a tablespoon of the azuki sweet beans on 2 different grilled mochi pieces. 4. Dissolve 3 tablespoons of sugar with 1 tablespoon of hot water and then add 3 tablespoons of soy sauce. Dip the final 2 mochi pieces into this sauce and make sure that it is fully covered. Finally wrap the mochi in a small piece of nori seaweed and serve! recipe & photo by Kim Yukawa. Kim is a food stylist and photographer. With the minimum of fuss, bringing you the food that is pleasing to your eyes as well as taste buds. Posted in Food and tagged mochi, new year, recipe. Bookmark the permalink. 20% Off All Vegetables and Meat In Store This Weekend!